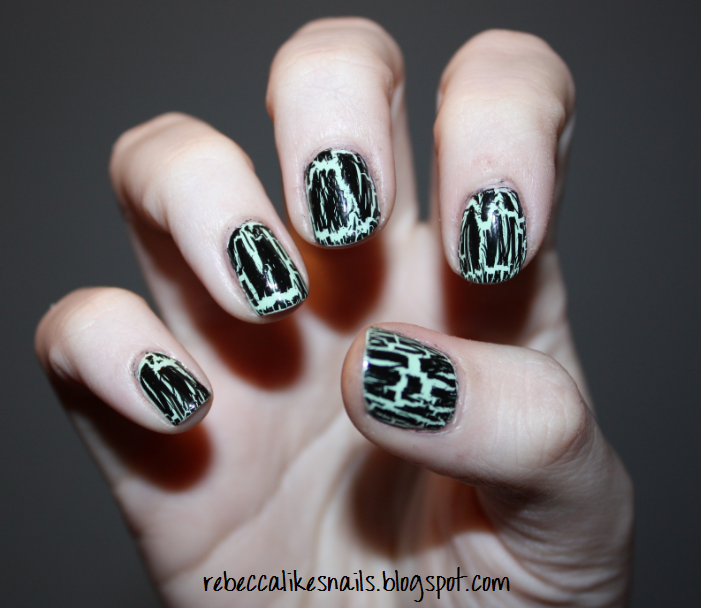 rebecca likes nails: more shatter? okay! I'm totally obsessed with shatter. Obsessed. I know it is selling out everywhere so when I found a second bottle at a salon here a few nights ago, I bought a back up bottle. Yesterday while I was studying at work (my job is really slack) I did my nails. This is OPI Black Shatter (of course) over Icing's Mint 2 Be. I really like this shade of mint, it is a little bit brighter than the other popular ones by China Glaze and Revlon. On this hand I accidentally did too thin of a coat of Shatter on my index finger, so it doesn't match the others! Haha. I've noticed that the lip of my Shatter bottle is getting all crusty and some of the hardened bits are coming off onto my brush, so to clean it I dipped a Q-tip in acetone and quickly wiped around the lip and the sides of the bottle. It helped a lot! I imagine I'll have to do this every couple of uses. 2 exams today. Wish me luck! I believe my local walgreens has the party of five glitter from wet n wild. Would you want me to pick it up for you and ship it your way?